When it’s time for performance reviews, your admin will launch the peer review selection. This will prompt an email letting you know to select the peer reviewers for your direct reports. You may consider consulting your team members before making selections. A few days later, your admin will kickoff reviews! Go ahead and complete all the evaluations listed on the left-hand side. Don't forget to check out the context panel to see other reviews of your teammate (if allowed by your admin, your employee's goals, and feedback about your employee. Please note that you many need to wait until all other reviews about you direct reports have been completed to submit those reviews, but you will be able to begin drafting your thoughts before reviews have been submitted. If you have multiple team members and want to stay up to date on the progress of their reviews, Lattice gives you real-time access. In your reviews, click on "Your Team" above the list of reviews that you need to complete. 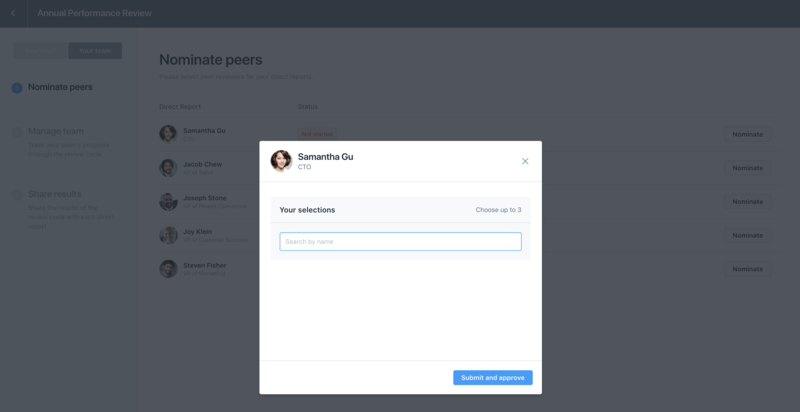 Here you can get insight into who is reviewing your team members, and whether or not they've completed their review. Your admin may ask you to write and share summary remarks with your direct reports as opposed to sending over the full content of their review. 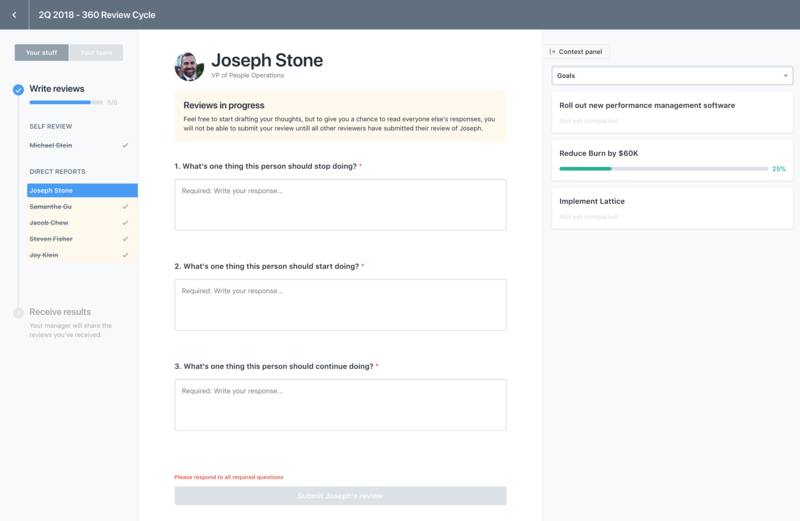 Lattice allows you to write summary remarks directly on top of the performance review so that you have easy access to the reviews. Make sure to schedule time with your team to discuss their performance!